Have you ever found your gear in chaos after throwing them loosely in the back of your truck? Or have you lost some luggage after using only a rope to tie them down on the roof of your car? 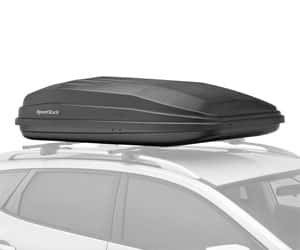 If you have found yourself in the predicaments as mentioned above, then you must be in a deep search for the best cargo roof box to secure your stuff. Consequently, your choice has probably boiled down to either Sweden’s Thule or Washington’s Yakima. As with most things, there is a lot of information that you need to look into before you spend your money on a product and the brands are just the tip of the iceberg. Do not panic; we will give you a breakdown of all to look into between our two cargo boxes and hope you will find your best pick. This brand has gone global, and its employees are bound together by a passion for helping outdoor enthusiasts. Thule aims to help its customers with transportation of anything with style and finesse. The Motion XT is characterized by a host of features and stylish designs that make you wonder why you never thought of buying it sooner. It’ a do-it-all cargo box with a strongly built and is also very easy to use. The Motion XT comes in four size options inclusive of an Alpine version that is designed for carrying skis. The roof of the cargo box is made using thermoformed ABS plastic which is both strong and lightweight. It has an aerodynamic design which keeps turbulence to a minimum and reduces wind resistance. Also in that respect, it has a lid to base overlap at the front of the cargo box that prevents wind from getting in between them and consequently leading to ‘fish mouthing’ in the area. The base is constructed with steel reinforcements that reduce any wear when going through high-stress areas and also ensures that your box will last way longer than anything it carries. To top it off, Thule has added a glossy black finish on the exterior of the box to give it a sleek look. Additionally, Motion XT uses PowerClick mounting system which makes mounting it on top of your car just as fast as the name suggests. It is fitted with an integrated torque indicator that makes a click sound when it is mounted correctly on the roof rack of your car. Just mount the box onto your car’s rack of any size and then tighten up the hardware by turning the rubberized knob until you get the little click sound. Another superb feature that Thule has to offer is the dual-opening lid. It allows you to access your gear from either side of your vehicle. For extra comfort and easy maneuvering of the lid, the outer handles are built with a grip-friendly design. There are also dual force lid lifters that take the edge off of by making it simpler to locate what you need or add extra stuff into the box. What’s more is that Motion XT uses Thule’s SlideLock system that has separate functions for opening and locking it up, which means that the locking mechanism is separate from the lid release. You never have to question if you got the locking or opening right. The SlideLock also automatically locks when you shut the lid. So no stopovers to check if the cargo is secure. All these features make the Motion XT the safest cargo box to haul your gear for any adventure. But like most flashy things, this product is going to cost you. The Thule Motion XT is a top of the line cargo box that excels in terms of appeal and quality. It’s incredibly easy to use and convenient. It features a collaboration of systems that make it easy to install and keep your cargo secure. Unfortunately, this cargo box bites a huge chunk out of your budget but its durability and resistance to wear make it totally worth it if you frequently unload and offload your cargo box. Yakima is an industrial leader in the production of car racks including roof racks, hitch racks bike rakes, and many other products. With over 35 years of experience and dedication from the in-house team, Yakima is committed to fitting vehicles of all makes, shapes, and sizes with the perfect rack solutions for all outdoor adventures. The products are then put through rigorous tests to ensure that they can stand the toughest driving conditions from remote dirt roads to snow covered mountains. The Yakima SkyBox Carbonite cargo box has a sleek design that makes it look like a high-end box, but it is designed for rugged trips in the great outdoors. First off, the box is made of 80% recycled ABS plastic which protects both the environment and the gear. The lid is textured Carbonite which is fitted with lid stiffeners that keep your lid intact and damage free. The lid stiffeners also make it easy to open and close the box when loading or unloading your gear and also keeps the lid rigid as opposed to buckling as you lift which would interfere with your gear extraction. 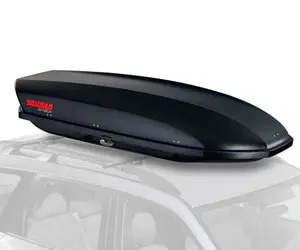 The Yakima SkyBox has an aerodynamic design for reducing drag, and that helps with fuel efficiency since your car won’t need extra energy to maintain its speed. The design also keeps the noise levels at a minimum due to the secure hold the box maintains on almost any roof rack. 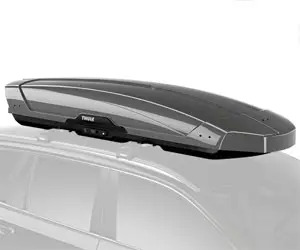 Also, Yakima SkyBox features a quick-release mounting system that requires no tools to assemble or remove from your roof. This mounting system has been designed to be compatible with Yakima round, factory, square and aerodynamic crossbars. You can therefore conveniently attach it without needing to buy replacement bars. Yakima cargo box is also constructed with a dual-opening kid that you can access from either the passenger’s or driver’s side of the car. For extra security, Yakima has installed a SuperLatch security lock on the outer part of the Cargo Box. It uses a turn handle that needs a key to unlock and lock it. This may be an issue if you misplace your keys. Finally, the back of the Yakima cargo box has a tapered design that reduces hatch interference. The Yakima SkyBox Carbonite is of top-notch quality and has a user-friendly design. It is perfect for anyone who wants to haul a large amount of gear on a pocket-friendly budget. This box can fit gear from up to five campers, and you get peace of mind knowing that your gear is safe and secure due to the SKS lock system. Both Thule and Yakima without a doubt make incredible car boxes that will get your gear securely moved from point A to B. They match when it comes to ease of installation, use, and safety features. Thule emerges as the overall best due to its sleek design, additional features that improve wind resistance and minimize wear. It is also currently the best roof box in the market and has everything you would want from a cargo box. That gives you added confidence when buying the product. Yakima is also a bit less user-friendly as it has a turn handle that uses a key to lock the lid instead of a simple slide like Thule. But if you are on a budget and need something affordable and just as good, then go for Yakima which is a no-nonsense box that gets the job done. Now since you have all the information, you can go for what suits your outdoor needs, your budget and keeps your gear safe and secure. But if you can afford the Thule, then you should definitely go for it. Now it wouldn’t be a decent review if we didn’t include a bonus product from a different brand for you to consider. SportRack products are also worth considering on the cheaper side of solid body boxes. SportRack, of Grand, Quebec Canada is a prime manufacturer of multi-sport roof rack systems, hitch-mounted products, truck-mounted racks, cargo boxes, and other accessories. The company first sunk its claws in the industry by manufacturing ski racks in 1980 and today are working as part of Thule’s load carrying systems. The SportRack Vista XL is meant to fit perfectly on SportRack Roof Systems and several other factory racks. It is engineered with ABS construction in order to make the box strong, water and UV-resistant. This gives your gear the best protection from direct sunlight and other road conditions like hanging branches, dirt or debris. It is also designed with a rear opening feature, meaning that you can open the box while facing away from the traffic. What you will love about this product is the quick release hardware mounting system that makes it easy to get the box on and off the roof of your car. Plus, the Vista XL box also locks, and it guarantees that your items won’t fall off when in transit. It’s also pretty lightweight, weighing just 28 pounds and the fact that it provides 18 cubic feet of storage is just outstanding. It’s easy to see why this cargo box will last you a very long time with waterproof features and ability to hold 100 pounds of gear. It is however not as aerodynamic as other cargo boxes in our review, and the overall appearance is rather basic. It is only available in one size so best be sure it fits your vehicle before you buy it. You are not getting all the bells and whistles with this cargo box, but despite the basic functionality, the SportRack Vista XL still makes up with efficiency and an affordable price. The plastic body is also very durable and offers both UV and waterproof protection for your gear. If you have to get something from the cargo box, ensure that you pack the most important stuff close to the rear to make it easier to get them without standing in traffic. Since it doesn’t have an aerodynamic design, you will get a buzzing noise when driving, and that may create drag. How much weight can a Thule rack hold? Are Yakima cargo boxes waterproof? Thule cargo boxes are not waterproof but other than that; you still get value for your money. But seeing that it is made of plastic and has a glossy design, it will do a good job at keeping most of the water from getting into your luggage. But for extra precaution, if your travel plans involve driving through flash flood thunderstorms, then we recommend that you store your laptop and digital camera in a dry bag. Thule Motion XT has a maximum load capacity of 165 pounds. Thule Force, another great Thule products, has a maximum capacity of 110 pounds. That’s pretty impressive figuring it has a sleek design that makes it seem to have a small profile. Yakima car boxes are weather resistant but aren’t waterproof. It also has lid stiffeners that keep the lid tightly secured to the base, and therefore there are no leaks that would flood your luggage. It would, however, be prudent to store anything that could get damaged by water inside your car or in a dry bag. No, but it comes with a sleek design, lid stiffeners and plastic construction that makes it pretty water resistant. SportRack’s parent company had its headquarters at Quebec, Canada but was bought by Thule in 2006. It now acts as a steady global seller for Thule after acquiring a rebranding of its packaging and logo. It is now sold via the same channels as Thule. SportRack Vista XL is both waterproof and water resistant. It should keep your gear in dry condition even when driving through heavy downpours. But you can never be too careful with the items that you love. Always protect them in a dry bag in case the SportRack cargo box wears with time and starts leaking. 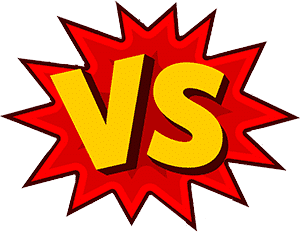 Our in-depth research on each one of our cargo boxes has revealed some strengths and weaknesses that will guide your decision on which product to go for. You need to evaluate the appearance, durability, security and most important of all the user-friendliness. Hopefully, you will come up with the best and most efficient cargo box for your travels.